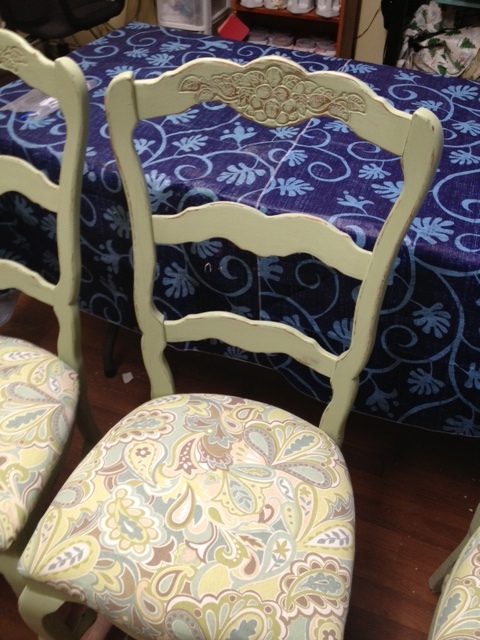 Ginger’s Attic Painting & Distressing Workshop is scheduled for Saturday, August 16, 2014 from 9:00am – 12:30pm. Reserve your spot now at gingersatticla@gmail.com. The cost is $50 and this includes your materials to do your item, drinks, and refreshments. See website pages for more information and pictures of past workshops. 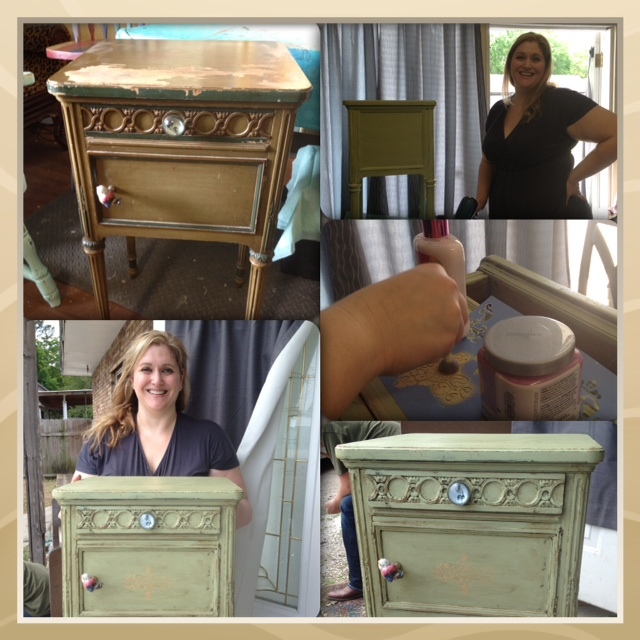 Come have some fun while learning how to make your own chalk paint and painting and distressing techniques. 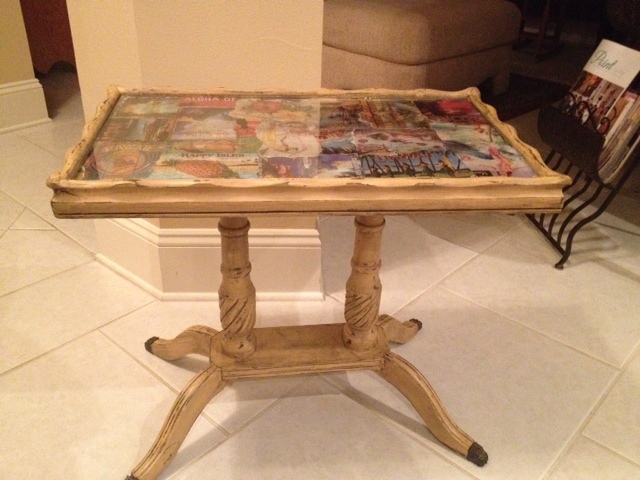 Learn how to turn old worn out furniture into a treasured piece! 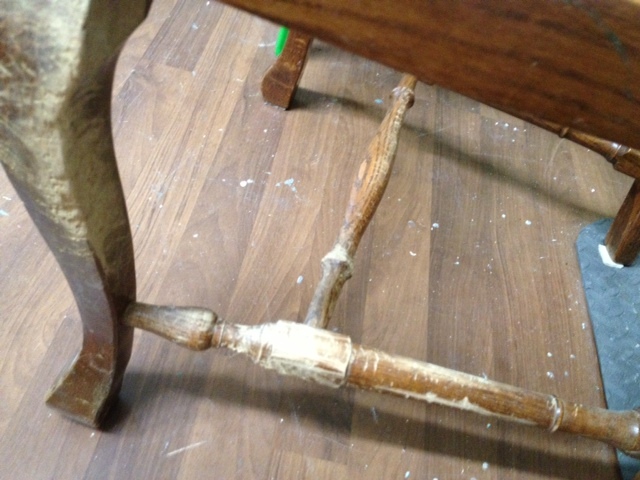 Before Pics of chairs: a couple of the chairs had some bad places that had to be sanded and some screws had to be replaced to make them sturdier. 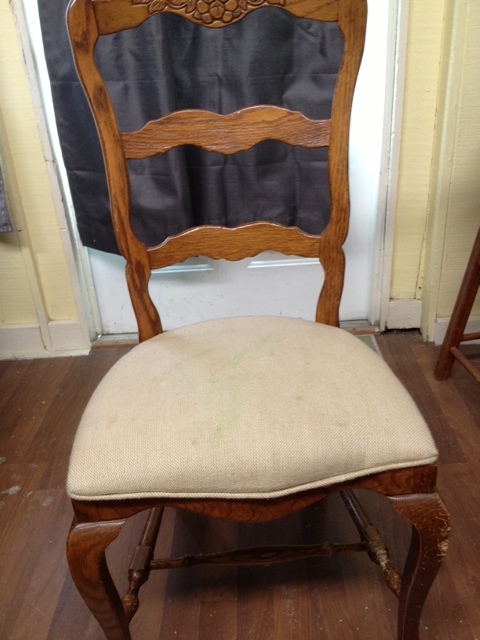 After Pics of Chairs: They were painted with green chalk paint, distressed, and clear waxed. The seat covers were replaced with a pretty green, blue, and brown fabric. 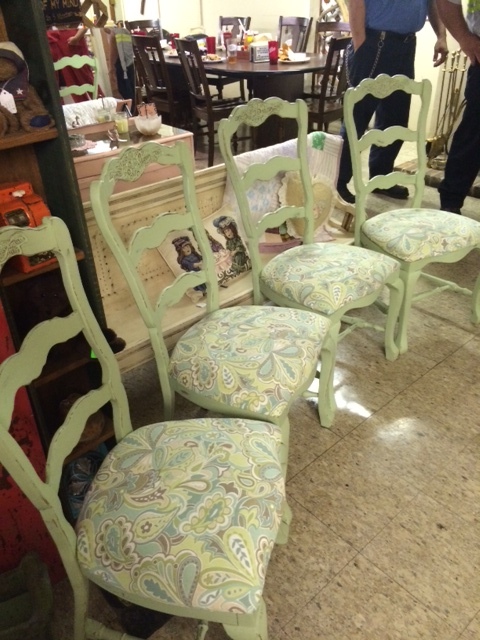 These chairs were given to me by a friend that found out I love to redo furniture. I think they came out really updated and fresh looking. That is what is amazing with painting and distressing. You can give a new life to something that was going to be trashed. These have SOLD! I bought this table at an auction a long time ago. It went through some hard times – a broken leg, then a lost broken leg but finally it got refurbished this week. 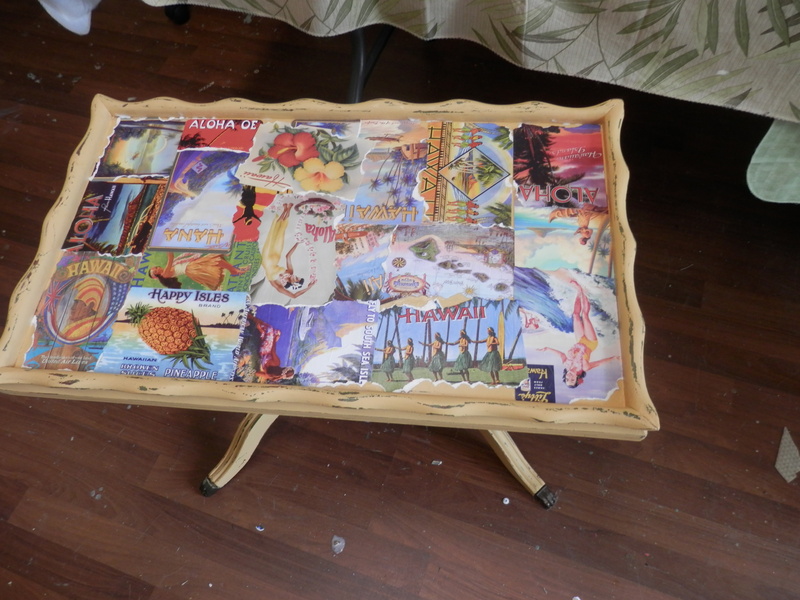 I found reproduction vintage postcards of Hawaii while on my vacation there and decided to decoupage them on this table. I couldn’t find the before picture of the table but it was an olive green color when I bought it. 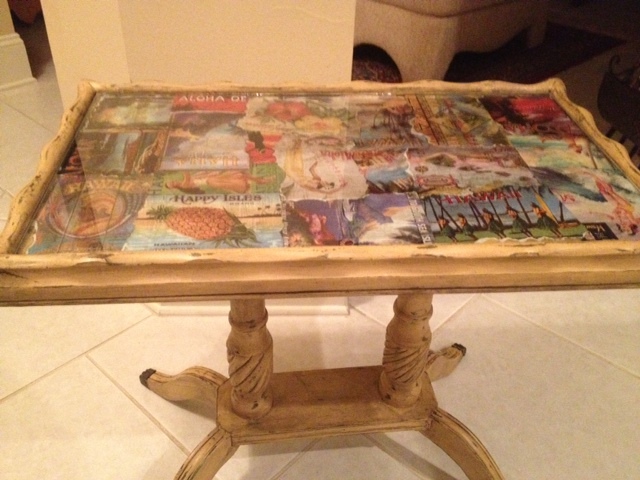 I painted it a light gold, distressed it and decoupaged the postcards on top, and antique glazed the whole piece. I tried something new from the advise of my artist friend, Amy Turner. I tore the edges of the postcards to make them look truly old and it also works well with soaking up the antiquing glaze. Then I brought the table over to the Glass House and got a piece of glass made for the top. I am going to use this at my house and it will be a great reminder of our wonderful trip to Hawaii. I do plan to put a polycrylic coat on it to seal it. This shows the postcards better but it was before it was antiqued.